There are numerous s considerations that go into data center design. Location, components, power source, and cooling are all among these considerations. In addition, one of the chief considerations when designing a data center is security. Ensuring security in the site location, site perimeter, computer rooms and facilities is a must. Disaster recovery must be considered in data center design as well. When choosing a data center location, natural disaster risk must be taken into consideration. Lightening storms, forest fires, earthquakes, tornadoes, and floods can all affect a data center site. A site should be selected that has an acceptable level of risk for natural disasters. It is wise to locate a data center away from potential man-made disaster risks such as freeways, airports, prisons, stadiums, and high crime areas. Data centers should not share the same building as other offices, and certainly not with offices that are not owned by the corporation. The perimeter surrounding a data center facility should be fully fenced and guarded, with access points that require employee identification. The area should be well lit and surveillance equipment should be employed. Parking spaces should be set a significant distance away from the building and the building should not have signage of any sort that identifies the corporation whose data center is housed there. Data centers should be designed so that neither windows nor exterior walls are part of the computer room. Windows create far too much of a security hazard and sunlight can introduce unnecessary heat into the room. If a data center must be placed along an exterior wall, a physical barrier should be constructed to prevent easy access to that wall. Each entrance to the computer room should have physical barriers, a security kiosk, and committed surveillance equipment. 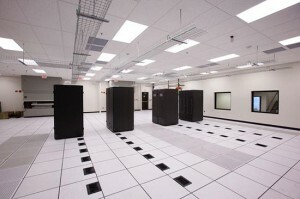 The computer rooms in a data center design should include redundant access to power sources, cooling units, and networks. An access floor of at least 18î should be included in the design to allow for cable management and adequate air flow. An air filtration system is imperative and high ceilings will allow heat to be easily dispersed. Climate control systems should allow for a steady room temperature that stays above 55 and below 75 degrees. Humidity control must be assured as well and should not fall below 20 percent or rise above 80 percent. Redundant cooling towers are a must and these towers should be isolated, placed a significant distance away from the parking lot. Backup power is an essential component of data center design. Sufficient battery backup power must exist onsite. The battery backup must have sufficient duration to allow for the switch to a longer term power backup, such as a generator. 24 hours worth of battery power is recommended, and a week worth of generator fuel is considered ideal. Network operations centers require fire, temperature, weather, and humidity monitoring, and must include redundant methods for communicating hazardous conditions to the exterior of the building. The network operations center must be designed in such a manner that it can remain manned 24 hours a day. Disaster recovery precautions must also be an integral part of data center design. Off site backup must be provided. If at all possible, it is wise to have redundant servers in another location. Thoughtful design can protect a data center from various hazards including theft, overheating, loss of power, and weather. Quality design will allow a data center to function consistently and properly and allow for adequate back up in the case of an emergency. This entry was posted in Computer Room Design, Data Center Design and tagged computer room design, data center design, phoenix data center design, scottsdale data center design. Bookmark the permalink.